Since the earliest days of security analysis—when the main question was which railroad stock to buy—Price to Book has been a cornerstone of the valuation process. Its inverse, Book to Price, is the metric behind academic studies that first shed light on the value effect, including Fama & French’s landmark HML factor. Price to Book is easy to define and simple to calculate, and its widespread usage by index providers, practitioners, and academics gives P/B a strong claim as the granddaddy of valuation metrics. A Decade Of Value Underperformance… Or Not? Unfortunately for Value managers, the effectiveness of price-aware investing has been seriously challenged over the last decade as indexes based on P/B have dramatically underperformed their Growth counterpart… and most other style factors. Chart 1 is a stark illustration of the problem, showing that the cheapest Book to Price quintile of the 1,000 largest stocks reached a peak in cumulative relative return in 2006 and trailing 12-month returns have spent most of the time since then below zero, punctuated only by brief rebounds following market drops in 2008 and 2016. 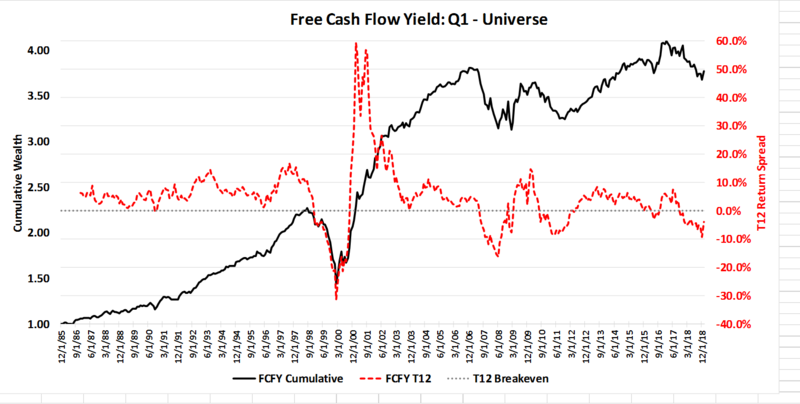 By contrast, Chart 2 displays a much different performance history for another value metric, Free Cash Flow Yield. This value ratio has been a consistent outperformer over time, and only reached its cumulative peak in 2017. The conflicting stories told by these two charts made us wonder which, if either, represents the norm and which is the outlier. We extended our research to determine whether other value metrics look more like B/P or FCFY. We also considered whether the universe of stocks involved was contributing to the book value problem, and the results that follow are categorized by various universe definitions. We assessed ten of the most popular quantitative valuation measures* in use today. Table 1 summarizes the annualized excess return spread between (a) the best value quintile minus the universe average, and (b) the best value quintile minus the worst value quintile. The story of Chart 1 is confirmed here, as Book to Price is the feeblest of the value metrics available since 1985. Price to Sales, another simple and easy metric, also ranks poorly. Ratios comparing EBITDA or EBIT to Enterprise Value score well, as do metrics relying on Cash Flow. Earnings Yield, Shareholder Yield, and P/E on Peak Earnings also have positive spreads against the universe and their respective bottom quintiles. * 1) Book to Price (inverted to deal with negative values); 2) Price to Sales; 3) Earnings Yield trailing 12 months (P/E inverted to deal with negative values); 4) Earnings Yield next 12 months; 5) P/E on Peak Earnings (highest EPS in the last five years); 6) EBIT to EV; 7) EBITDA to EV; 8) Cash Flow Yield (operating cash flow / market cap); 9) Free Cash Flow Yield (operating cash flow minus capex / market cap); 10) Shareholder Yield (dividends + net buybacks / market cap). We wondered how the return history of the more successful metrics compares to the dismal lost decade of B/P. Chart 3 shows the composite cumulative wealth for “Combo 4,” an average of EBIT/EV, Free Cash Flow Yield, Earnings Yield, and Shareholder Yield. Defined in this manner, Value powered its way higher for most of the last decade and only topped out at the end of 2017, finally succumbing to the Social/Mobile/Cloud (SMC) mania of 2018. This diverse assembly of profitable Value signals presents a far different picture than B/P and gives price-aware managers hope that the style still has merit, despite the woebegone conclusions of style research using Value’s original favorite metric, Price to Book. Stage 2: Is Size The Real Issue? The second stage of our research considers whether the size effect undermines Price to Book. We calculated quintile returns on the same 1,000 companies measured on a cap-weighted rather than equal-weighted basis. Table 2 reveals that B/P is again the worst value factor and tells a more nuanced story about the impact of size on Value performance. We would expect any successful factor to typically show the highest returns for quintile one, middling returns for the universe average, and the lowest returns for quintile five. However, six of the ten metrics in Table 2 show smaller return spreads in the Q1-Q5 column than they do for the Q1-Universe column. This result means that the most expensive quintile of these six factors outperformed the universe or, alternatively stated, that Q1 and Q5 both outperformed the average stock. This U-shaped factor payoff is unique to the cap-weighted study and suggests that a meaningful part of Value’s struggles of late has to do with the positive returns of very large and expensive companies such as SMC. 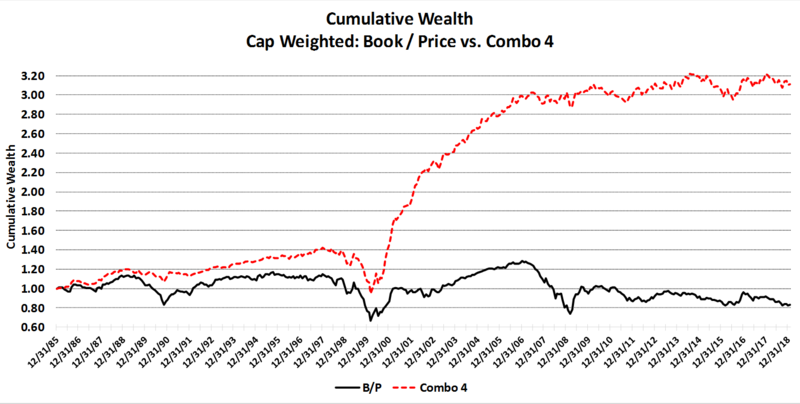 Chart 4 plots the cumulative wealth of our four-factor Value combination versus B/P using cap-weighted returns. 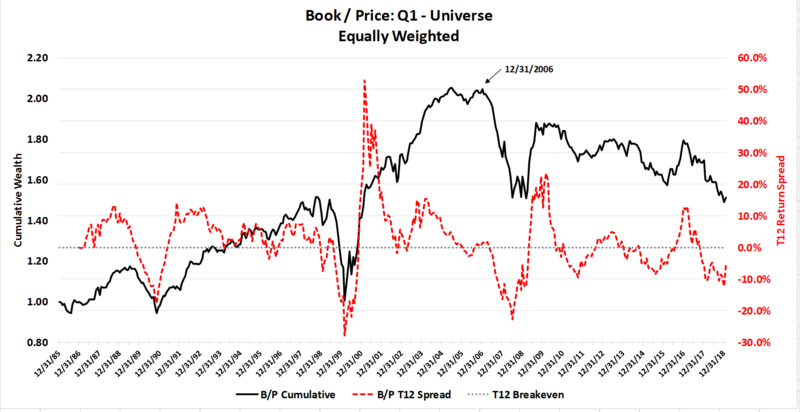 Cheap B/P spends the entire period fluctuating around breakeven and actually finishes the period with a negative return spread against the universe. Meanwhile, the combined indicator chugged higher into early 2018, again suggesting that the long drought in Value has more to do with book value itself than the generic concept of buying cheapness—which we still find to be incredibly compelling. We performed a second size test by examining the returns for companies with market caps ranking from 1,001 through 2,000, which in today’s market equates to a range of $1.0 billion to $3.4 billion. Table 3 and Chart 5 summarize the effectiveness of value metrics in the SMID-cap universe, with similar but more extreme outcomes. 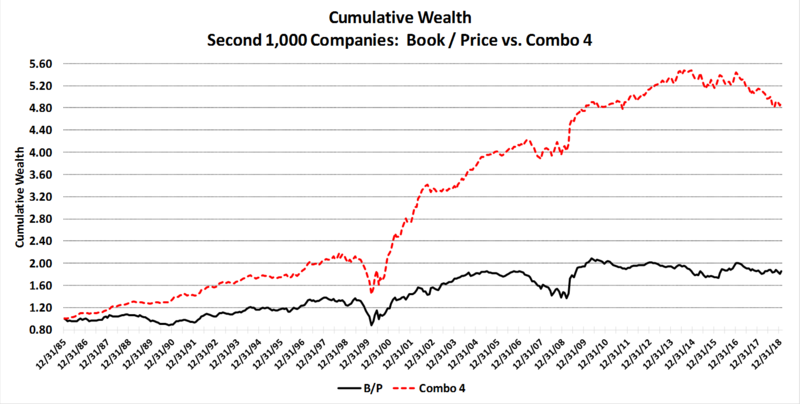 B/P helped Value investors double their money over the time span versus an outright loss in the largest companies, but the Combo 4 indicator performed like a champ with cumulative wealth growing five-fold. Buying cheap and selling dear appears to work superbly in SMID-caps, but the B/P metric remains the dullest tool for the job. The charts for the following stages look similar to the preceding charts so we omit them in the interest of brevity. Value aficionados have long understood that the style is dominated by certain sectors or themes such as Financials, Cyclicals, and Commodities. We tackled this potential bias by running Stage 3 of our research on a sector-neutral basis. Valuation metrics are applied at the sector level and then the cheapest quintile of each sector is rolled into an overall best Value quintile. Table 4 shows that the sector-neutral results (equally weighted) generally mirror the previous tables, and again slots Book to Price and Price to Sales as the worst performing factors. Previous Leuthold Group research into Value’s lost decade identified the Financial sector as a key contributor to poor style returns following the credit crisis of 2008. In Stage 4, we wrap up our analysis by excluding Financials and Real Estate from the universe and calculated equally-weighted returns on the remaining companies. Table 5 confirms that valuation metrics based on earnings and cash flow have done very well for themselves and excluding Financials and Real Estate does not change the narrative. We dismiss the “too many Financials” hypothesis as the root cause of B/P’s shortfall. What Ails Price To Book? There are several reasonable explanations for the loss of efficacy in Price to Book valuation over the years, three of which we find particularly convincing. Accounting practices that route more items (write-offs, adjustments, mark to market, etc.) through the equity account serve to disconnect it from ongoing business operations. The importance of intellectual property to economic value is increasingly substituting for the bricks and mortar of bygone days. Many of the most valuable assets in today’s business world never make it to the balance sheet or are valued at prices far removed from their true worth. Debt-financed buybacks reduce book value without affecting productive assets, and the companies most able to execute debt for equity swaps—and thus appear more expensive than they otherwise would—are profitable blue chips with excellent cash flow prospects. We do not see any reason to suspect that these influences will reverse course over time; in fact, our guess is that future changes to accounting regulations will make book value an even less relevant measure of a company’s authentic economic value. We think P/B is a valuable tool for measuring relative pricing across time and across markets. Few other metrics have the long, continuous history and wide availability for numerous indexes, countries, and sectors, making comparative judgments about valuation easy and meaningful for market analysis. Know your index: S&P, FTSE, Russell, and MSCI all use P/B in their calculation of Value and Growth indexes. To the extent an index relies on P/B, it may fail to capture the positive impact of the more successful value measures we have examined. Despite its history, simplicity, and common usage, we encourage quantitative investors to focus on the better-performing value metrics and eschew P/B and P/S due to their lack of efficacy in identifying outperformance. The basic ratios of Price to Book and Price to Sales are easy to calculate and are applicable to most industries, but they fall short in the task of identifying alpha opportunities. Quant analysts are better served by developing a robust value analysis around the top performing metrics. Shifting away from P/B will alter the sector and thematic makeup of universes, indexes, and portfolios. We remind Value analysts to be aware of the different sector tilts generated by each value ratio and to interpret the resulting positions in that light.